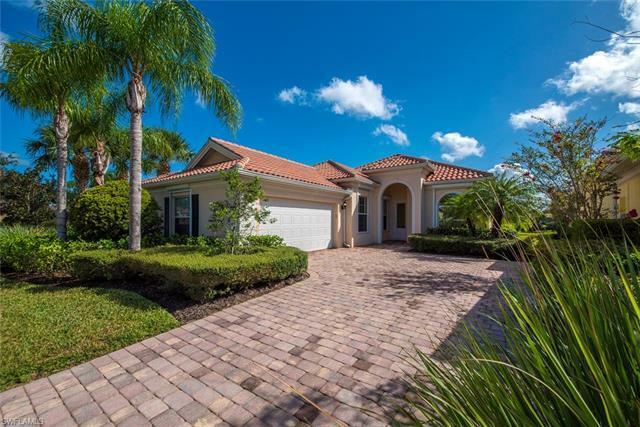 28831 Yellow Fin Trl, Bonita Springs, FL.| MLS# 218055635 | Southwest Florida Residential Real Estate for Sale. H.13492 - Do you LOVE the Villagewalk lifestyle, but want a "new" home? Look no more!! This home has only been used a couple of weeks a year. Impeccably maintained with new A/C in October 2017, new refrigerator January 2018, new central vac system installed last year, & permanent storm protection on all doors and windows. This "newer" Oakmont has higher vanities and comfort height commodes not found in the original Oakmonts. This home is neutrally painted allowing you to personalize it to your taste. Kitchen features warm wood cabinets, granite countertops, stainless appliances. Living area has soaring 12' ceilings and a lighted wall unit with floating glass shelves, NO mirrors or bulky cabinets. All of the sliders in this home have "Vertiglide" blinds which tuck discreetly away, but give full privacy when they are closed. All bedrooms have ceiling fans with lights. The garage has additional shelving/storage and an insulated garage door. Laundry room has lots of cabinets for storage, a utility sink, and a glass block window for light. Villagewalk has 2 pools, 8 tennis courts, coffee shop, hair salon, gas station, bocce, basketball, pickleball, bar & restaurant that serves the pool.